Zwift is a massive, multi player, indoor cycling game that connects riders from all over the world. It's a digital destination that creates a social environment for riders who would otherwise ride alone in their home. Simplify a somewhat complicated product offering. Differentiate the brand from spin and indoor workout classes. Create a visual vocabulary and brand voice for a brand new company. The homepage needed to succinctly sum up what the product was and how it worked. We started with the line "Indoor Cycling. Outdone." and paired that with a video showing the game in action. We then followed the video with a simple three step visual illustrating how easy Zwift was to set up and a link to check the equipment you might already own for compatibility. Finally we illustrated the three main product benefits. 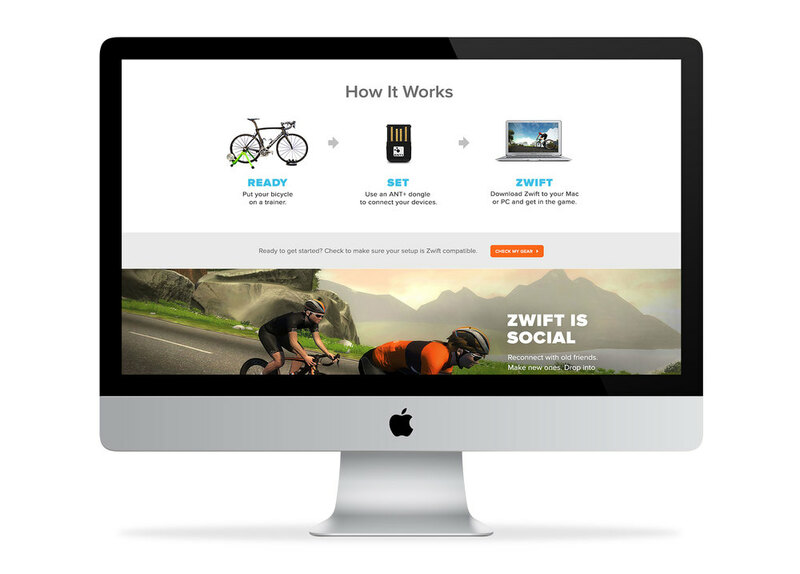 Zwift is social, it's competitive and it's your training partner. 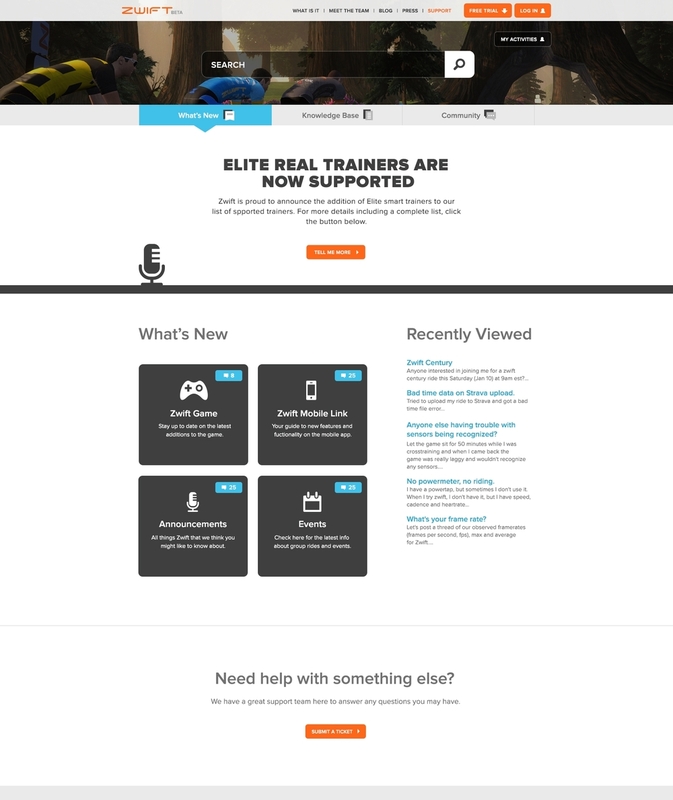 The homepage served as an overview to Zwift. On subsequent pages we provided more information about the product, how to create the perfect setup for your lifestyle and download links to the mobile app. Everything was designed to be engaging, fun and easy to use. We took complex information, such as the countless equipment combinations and simplified that into three main setup options with a handy wizard to narrow down your options for you. Once a user was up and riding on Zwift, they needed a way to keep track of their progress as well as connect with friends. So we designed a Dashboard to showcase all of this information. It prominently displayed a users overall stats followed by an activity feed with basic info about each ride. Nothing is more frustrating than having a question and not being able to find the answer. In order to facilitate the smoothest support experience possible, this section was designed to help users find help quickly and efficiently. We started by making search the most prominent item on the page, followed by links to the three main content categories. Each subpage was then bookended by search at the top and a form to submit a ticket at the bottom. This made it easy for users to get in contact with a real human if they needed to but encouraged search as the first option, thereby decreasing the number of tickets the support staff had to weed through.